This post is sponsored by Mushrooms Canada. As part of the fun leading up to our annual conference for food bloggers and industry pros alike, Mushrooms Canada hosts a fun Appetizer Spotlight contest for FBCers across the country to win a full conference pass as well as having their appetizer prepared by the hotel chef and served to all the attendees. This year's focus was on the Blend and Extend concept and the winner was Kacey from The Cookie Writer with her Mushroom and Beef Cheese Balls! 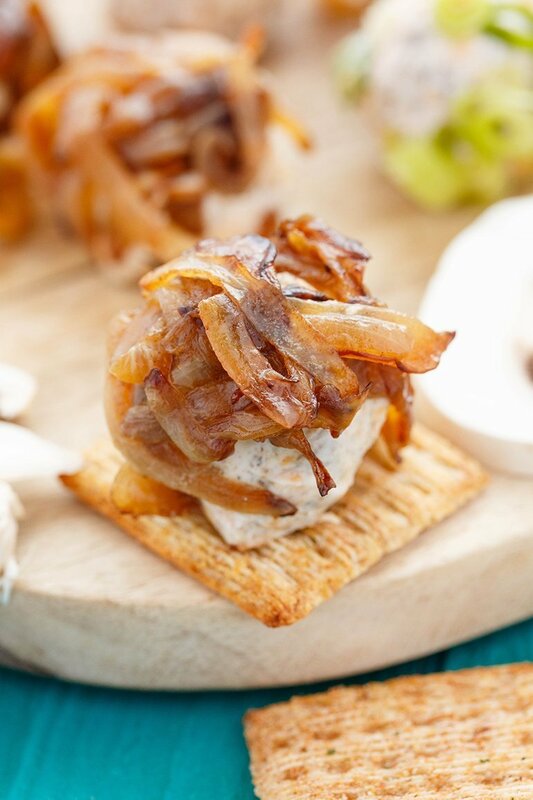 But there were so many delicious, tempting appetizer entries that we wanted to share all of them with our readers - and with the holidays fast approaching you can never have too many appetizer ideas in your back pocket for easy entertaining! These mini mushroom and beef cheese balls by The Cookie Writer were the winning entry in the Mushrooms Canada FBC2016 Appetizer spotlight contest with their easy to make cheesy goodness! These cute Mini Tomato Farcies (sausage and mushroom stuffed cherry tomatoes) from eat. live. travel. write. will add some festive colour to any appetizer platter! These Moussaka Mini Pies from True Sustenance are a perfect little bite to have in your hands at any party! These Beef and Mushroom Crepe Rolls with smoked cheddar from Compelled to Cook are great for dipping and sharing! Serve these Chicken Souvlaki Meatballs from The Yum Yum Factor individually or on a skewer for easy handling. Garnish with some pomegranate seeds for a pop of seasonal colour! These little bitty Mushroom and Ground Beef Bites from Love Good Food are the perfect one bite appetizer! Everyone loves strudel so why not try a savoury version for your next party like this Beef, Spinach and Mushroom Strudel from Bake. Eat. Repeat. Sliders are always a fan favourite at parties and these Blended Saucy Sliders from Everyday Allergen-Free are no exception! A piping hot Beef and Mushroom Samosa with a dab of Tamarind Chutney from Food Mamma will add a little zip to any party! A little fiesta for your mouth - that's what these Blended Taco Bites from Our Hideaway are! Blending ground beef with mushrooms is the secret to these crispy Blended Fried Ravioli from The Tasty Gardener. Mushrooms, beef and Béchamel are the secret to these delicious Meat & Mushroom Melts from Kravings. A fragrant and flavourful Keema dip from Jo & Sue is a great pairing with Naan bread or tortilla scoops or even lettuce cups! Add the flavours of Morocco to your next party with Homemade and Yummy's ROCCAN rolls paired with fig dipping sauce! We love this mini pita take on these Spicy Sliders with Salsa from Tasty Delights. Beef and Mushroom Spring Rolls from Bakers Beans are sure to be a hit with their crispy shell and soft filling! These look fantastic! I bet the judges had a reallllllly hard time deciding on the lucky winner! We’re just glad we didn’t have to choose!